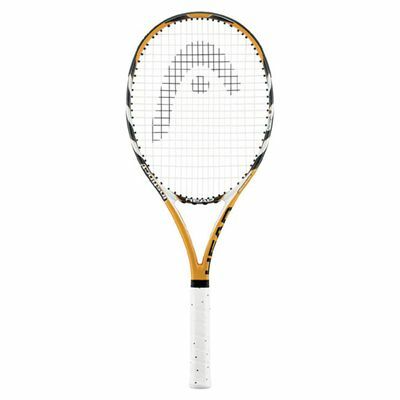 The Head Microgel Instinct Tennis Racket - In the faster paced and more aggressive modern game, the nature of tennis has changed from the past, and as a result there is a new breed of frames to meet this change. The Head Microgel Instinct Tennis Racket with new technologies and techniques has evolved. With these “modern tennis” techniques a player can benefit from huge gains in performance, but this also puts huge demands on the equipment used. The modern aggressive player wants a tennis racket that can stand up to the challenge, and Head’s innovative new MicroGel™ technology delivers on this front. With a rock-solid feel and touch, and with the lowest density of any material, the Head MicroGel™ is a revolutionary new silicone-based material designed for stability in the frame without adding weight. Head has combined MicroGel ™ with stiff and strong carbon composite fibers to create a racket with incredible responsive qualities. On ball impact, MicroGel™ uniformly distributes the impact load around the frame to provide the most rock-solid feel and superior touch ever achieved in the game. What happens during ball impact? MicroGel™ deforms and compresses, absorbing and dispersing the impact to the entire frame, then returns quickly to its original shape. The effect is a stiffer frame and better feel on every shot. Head’s new Microgel Instinct Tennis Racket has an increased head width, which can allow the ball to slide further across the stringbed for unmatched spin generation. It also makes this racket more forgiving across the width, which is after all the point across which most shots are played. So the benefit is the increased head width causes much greater forgiveness, and allows the ball to come off the strings with much greater spin. for submitting product review about Head Microgel Instinct - Tennis Racket.